Boveda Smart Sensor goes right in your humidor. You can lay the sensor on your cigars or affix it to your humidor’s lid. 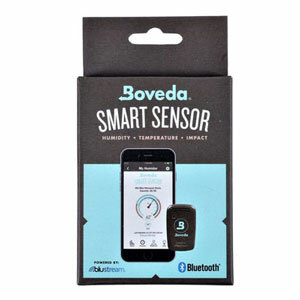 The sensor communicates via Bluetooth® to the free Boveda app on your iOS 8.0+ or Android 5.0+ mobile device. You can now access your humidor’s conditions all the time. And you can extend the sensor’s reach to access real-time data from anywhere by syncing it up to a second compatible tablet or phone. The Boveda Smart Sensor Detects humidity and temperature changes as they happen, Keeps a history of daily, monthly and seasonal patterns that may affect your cigars, Gauges the freshness of your Boveda and alerts you when it’s time to reorder and Senses if your humidor’s been moved, dropped or opened.